Nicole’s life journey has been an incredible one. She is a fighter by nature and has been dealt a hand by God that would make the most experienced poker player sweat. Just over 6 years ago, Nicole was in an ATV accident, leaving her with a closed head injury, fractured skull, partial deafness, and Bell’s Palsy, leaving the left side of her face mostly paralyzed. 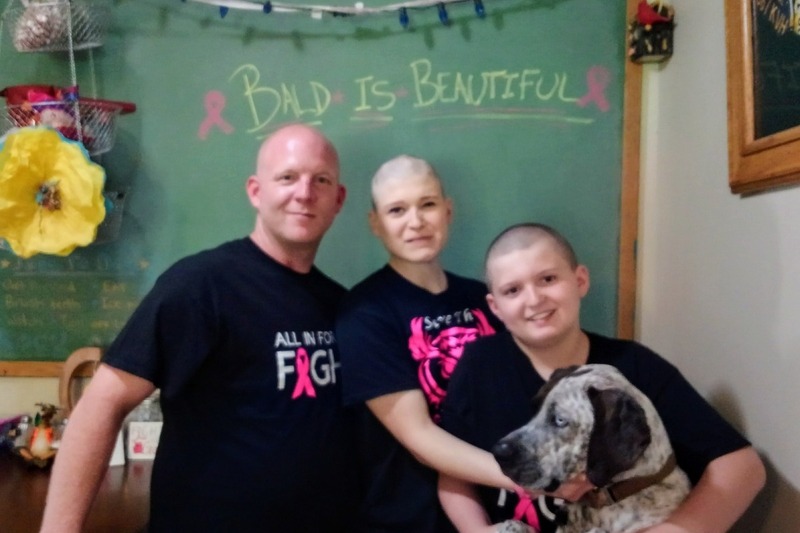 Now, Nicole has been diagnosed with breast cancer at the startling young age of 31. News of such a diagnosis is devastating to anyone, but it is especially difficult when you still have your whole life ahead of you. A short time after her diagnosis, she underwent a double mastectomy with double reconstruction. Quickly she developed an aggressive infection in her right breast and the implant had to be immediately removed. She was on heavy antibiotics which delayed her chemotherapy treatments, further pushing back her much-anticipated end date of treatment. She will eventually need to have a second reconstructive surgery to replace her missing breast. Michael, Nicole’s fiancée, has been working diligently to tend to Nicole, her personal needs and care, her Doctors’ appointments, her chemotherapy appointments, and everything and anything she needs. Michael has been solely tending to their 11-year-old son Joseph, doing homework, school shopping, making lunches, and making sure Joey feels secure and supported through his Mom’s treatments. Michael is doing all this, without hesitation, while working 6 days a week and managing everyone and everything in the household. His only day off is spent with Nicole at her appointments and chemotherapy treatments. This fundraiser is a way that we can all help this family focus on the care and healing of Nicole. The worry and exhaustion of making ends meet since Nicole is unable to work is consuming their energy that is needed for Nicole. With your help, we can make a difference. Even the smallest contribution will add up and help pay for the ever-accumulating medical bills while also offering relief to Nicole and Michael, so that they may continue to prioritize Nicole’s wellness. Thank you for your care and support for this family. Your generosity helps the fight against cancer, one diagnosis at time.